The ancient history of Samsunghyeol says three gods Ko, Yang, and Bu married three woman who took a voyage from Puk rang, currently known as Wando. The three women brought 5 kinds of seeds, a cow, and a pony with them to Jeju. According to the myth, they are the original Jeju people. On My 3rd, JDC junior journalist visited Samsunghyeol and ask visitors to share their feelings about Jeju becoming and international city. Fammy NG, a woman from China, said “What can be done to make Jeju an international city? 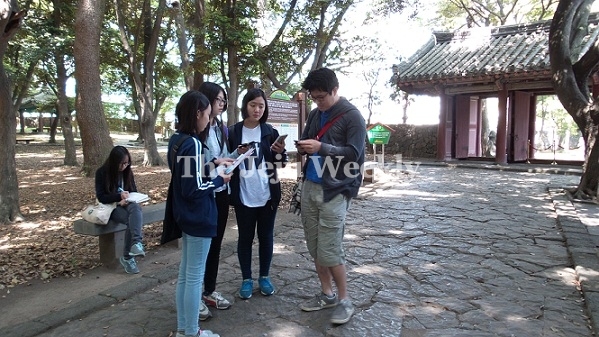 Jeju is already international city.” She said she likes Samsunghyeol because there are many historical things. On business man visiting the park said. ”Jeju is a part of Korea. I have traveled to Jeju many times and it’s really fresh and we can take a rest in Samsunghyeol.” He also said Samsungheyol can help encourage tourist and promote Jeju as an international city. Samsunghyeol is a good experience. Why not take a tour or walk around the international city called Jeju?